Media: Soft, glossy, laminated card, colour covers; A4 portrait format on 96 semi-gloss, colour pages, with over 240 illustrations. Advantages: New colour profiles of all major aircraft types and squadrons operating from Wattisham. Interesting array of photographs (black & white as well as colour), many from private collections. Conclusion: Well produced and presented book, about one of the best-known RAF Stations in the UK. An enjoyable read and a book which will appeal to those with an interest in the history of the RAF. To be honest, despite having an interest in military aviation for some 40 years or more, actual books about the history of current or former RAF Stations (or indeed, those of other Services or countries) are conspicuous by their absence from my bookshelves. On the other hand, give me a book about a particular aircraft of interest and I'm away – I guess its a case of 'each to their own'. So it was with some surprise and not a little apprehension, that I found a copy of Ad Hoc Publication's 'RAF Wattisham - A Pictorial History' securely wrapped in the latest package from them. The enclosed compliments slip said, 'Something a little different!' - so let's take a look. Reassuringly, readers of Ad Hoc's more well-known 'From The Cockpit' series will be familiar with the book's format and layout, being A4 with soft glossy covers, containing high quality material and superbly reproduced on semi-gloss pages. RAF Wattisham (52o 07' 31'' N, 0o 57' 10'' E), lies in the county of Suffolk in the SW corner of England, some 10 miles WNW of the county town of Ipswich. 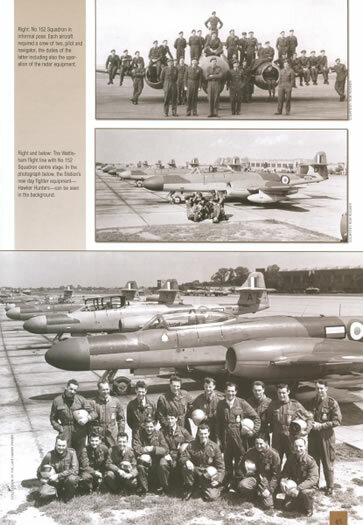 Written by Dave Eade, a well-known local historian, the book's cover is graced by a fabulous colour shot of of No.111 (F) Squadron's famous 'Black Arrows' Hawker Hunter formation aerobatic team at the top of a loop, with a village local to RAF Wattisham in the background. 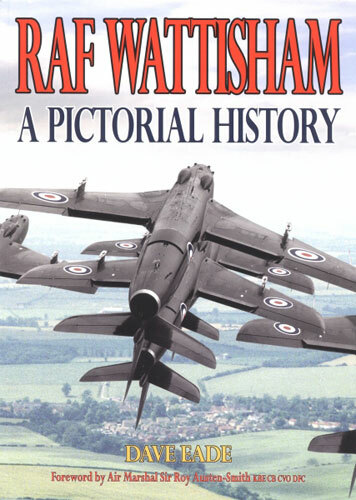 After both a preface (by the author) and a foreword (by Air Marshall Sir Roy Austen-Smith KBE CB CVO DFC), the history of the station is then told, perhaps not unsurprisingly, in chronological order. Starting with RAF Wattisham's birth in the late 1930's, the book's thirteen chapters tell the tale of the stations changing role, occupants and aircraft. Beginning with Blenheims, then moving to Bostons and Beaufighters, a big change came with the departure of the RAF and the arrival of the US Eighth Army Air Force with their Lightnings and Mustangs, in 1942. Postwar, with the RAF back in charge, and we are into the jet era. Meteors of all kinds, were followed by the Hunter (including those 'Black Arrows') and the Javelin, all to be later supplanted by the E.E. Lightning. Wattisham's peak was marked by the presence of the mighty Phantom, before the Station relinquished its front-line RAF role in 1992; but even then the story was not over. The last two chapters cover the present-day occupants of the station, who now use aircraft of the hovering variety; RAF Rescue Sea Kings, Army Air Corps Lynx's (recently replaced by the Apache Attack Helicopter) and last but not least, Wattisham now also hosts the Suffolk Police Eurocopter and its Support Unit. Although in my simple way, I have (predictably?) used the aircraft to define the chronology, this book is not just about the hardware. The book is also about the people; the squadrons, units and individuals who passed through Wattisham on their way into history. Some individual people or actions are picked out for special mention and anecdotes from former pilots, Station commanders and other service personnel, are featured in 'box-outs' within the main text of each chapter. Subtitled as a 'Pictorial History', the book is also profusely illustrated with both excellent photographs (colour and black & white), as well as specially commissioned colour artwork profiles of the major aircraft types flown from the Station. This is a very well produced and presented book, about one of the best-known RAF Stations in the UK. Despite my initial misgivings about the subject matter, I certainly enjoyed reading about the life of the Station and the wide variety of people and aircraft which crossed its threshold. Whether I would have bought and read it, had I not been lucky enough to receive it for review, is another matter. Obviously, there is a place for books on such subjects and I did learn some new facts which I would otherwise have missed, but despite all that, I still cannot see myself starting a new 'RAF Stations' section on my own bookshelves. 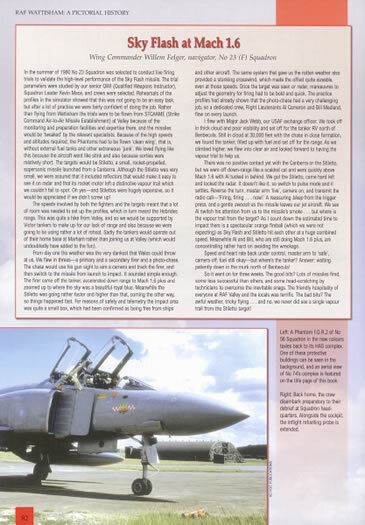 However, this is a personal viewpoint and should not detract from the otherwise excellent content, which I have no doubt will appeal to those with more of an interest in the history of the RAF per se, than I do. 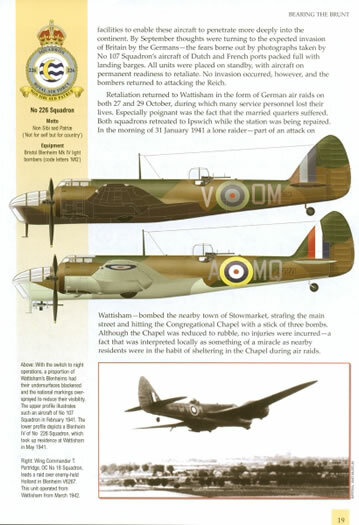 Just one last point; there is no indication that I can see, as to whether this is just a 'one-off' book (by coincidence or design, Suffolk is also the location of Ad Hoc Publications), or the beginning of a new series for them, but either way, if this is your 'thing' then 'RAF Wattisham – A Pictorial History' will not disappoint.